If you've visited London recently, you may well have seen the Shard, which now dominates the city skyline. It's the UK's tallest skyscraper, its 87 storeys reaching a staggering 310 metres (1,016ft). However, the Shard lags behind a series of largely anonymous structures, dotted across the UK countryside. They're part of a network of TV transmitters which has sprung up across the country over the last 60 years, beaming pictures into millions of homes. 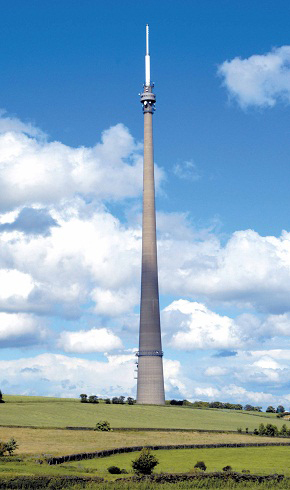 The tallest can stretch well over 300 metres – such as the Belmont transmitting station in Lincolnshire. Built in the mid-1960s and serving viewers in Lincolnshire and East Yorkshire, the Belmont mast was at one time the tallest structure in the EU. 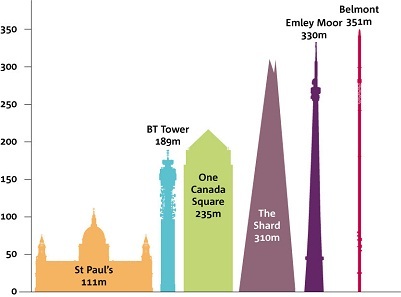 Its current height (351 metres) is 41 metres higher than the Shard. Caldbeck in Cumbria, standing at 337 metres, also towers above the Shard. The original Caldbeck mast came into service in the early 1960s, but a replacement mast was built by owner Arqiva during 2008 in preparation for digital switchover, making it the first major new television mast to be built for 35 years. But it's not just their height and function that gets these masts noticed. The first Emley Moor structure was erected in 1956 to broadcast ITV programmes to Yorkshire. It was replaced with a second, taller mast eight years later and it was this that came crashing down on 19 March 1969. The new tower consists of 7000 cubic metres of concrete and weighs 11,200 tonnes. It has a hollow centre which has two lifts and an 865-rung ladder. The foundations are 6.1 metres deep. The Emley Moor transmitter (330 metres) in West Yorkshire is a Grade II listed building, as well as being the tallest free-standing structure in the UK. The current tapered concrete tower entered service in 1971 after its predecessor was felled by ice and strong winds two years earlier. As well as being a notable Northern landmark, the Emley tower has been described as combining perfect technical performance with architectural elegance in its supreme slenderness. The UK's first television transmitter was at Alexandra Place in London, which began broadcasting BBC programmes to London and the Home Counties in 1936. It wasn't until 1949 that Sutton Coldfield became the first transmitter to broadcast outside London, bringing BBC TV pictures to audiences in the Midlands. This was followed two years later by Holme Moss in the Pennines, and then by Kirk O'Shotts in Scotland and Wenvoe in South Wales the following year as the rollout of a national television service gathered pace. You could be forgiven for thinking that in this era of satellite and cable, the humble TV transmitter has lost some of its importance. But if you receive your TV through an aerial, it will get its signal from one of over 1150 transmitters dotted around the country. Most viewers can receive their programmes from one of the 80 major transmitters that are spread across the UK. However, some households are not able to receive a reliable service from one of these transmitters, perhaps because they live in a valley, or live a long way from a major transmitter mast. Instead, most of these households can receive signals from one of the 1,074 smaller ‘relay' transmitter sites that extend coverage to communities outside the reach of the major transmitters. If you want to find out which transmitter serves your area, check your postcode on Digital UK's website. Ofcom also publishes maps showing the locations of TV transmitters in each broadcasting region of the UK. Transmitter coverage does often overlap, and signals from the major transmitters travel much further than the smaller relays. Therefore the closest transmitter to you may not necessarily be the one you receive your signals from.